We get asked which is the 'best' shock to choose for the droplink bikes a fair bit. Last week Cy sent out a newsletter to the email subscribers talking through shock options we have, but also sharing some interesting discoveries made along the way with testing this summer. The point of this weeks' email is shock choosing and tuning. With the choices of X Fusion O2 RCX, Cane Creek DB Inline and Fox Float X2 on the Rockets and the first two on the Flares, there are options here both from a budgetary perspective, but also from a tuning and performance perspective. As you might expect I'm often asked which shock is 'best'. As you might expect from me, the answer is a big, obvious It Depends. So, I'll share some thoughts on why we use the shocks we do, but also some of the results of testing - both subjective and timed - that we have done which might help you understand a little more about the subject. First up, the X Fusion O2 RCX is their top of the range inline shock. Like all things X Fusion, don't be fooled by the price! The RCX version have 4 compression settings on it's little blue lever and although the fourth is very firm, it's not a full lock out like the less sophisticated RL and RLX versions of the same shock. Allied to this, because we work directly with X Fusion as an OE (Original Equipment) our shocks have our own compression tune on them. Because by and large we're not level flickers out of preference, we have more low speed compression damping dialed into the shock so that it's possible to run in the open or first compression modes pretty much all the time with good all round performance. It's a great shock, and particularly on higher load trails like bermy trail centres it really comes into it's own. Compared to the Cane Creek or Fox shock it does have some limitations when things get really fast and rocky, but then to be fair, X Fusion have other shocks which do this better.too. What we wanted was something with great 'set and forget' capability with a wide operating window for people who just want to get on and ride. There's a reason most of the demo fleet run this shock - when Sam needs fast turnarounds and quick set ups it's the X Fusion that wins hands down. It's easily the equal of something like the Fox DPS shocks and it's far nicer to ride than anything in the Rock Shox inline range we have ridden in our opinion. 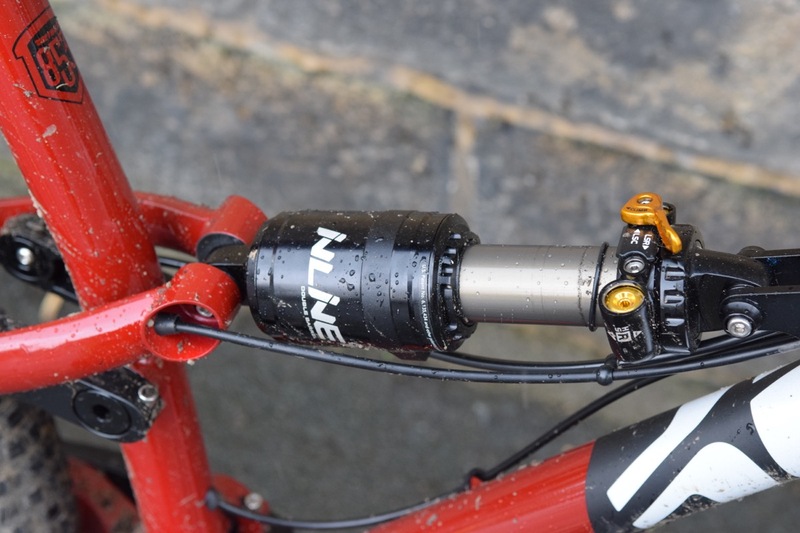 We know plenty of people like Rock Shox, but for preferences they have odd rebound behaviour. Moving to the Cane Creek DB Inline this is the shock most people are weighing up whether to spend a little more money on. You have to be honest with yourself with this shock. Firstly, do you want to spend some time and use up a couple of your rides playing with the shock and doing runs down the same section of trail? If this feels like hard work, then get the X Fusion. Having so much adjustment on a shock can lead to what have called Setup Anxiety. When you don't fully understand the shock and are constantly thinking there must be a better option in there for the trail you're riding. It's a real thing and it can ruin your enjoyment of your riding if you let it get you bothered. The second thing you need to consider is whether you're happy with the shock moving around quite a lot. The Cane Creek DB Inline has not only got a more capable feel than the X Fusion in fast, rocky, terrain, but it's also much less conventional feeling at slower speeds and when pedaling. It feels soft and even with the climb switch on it still moves a fair bit when pedaling hard up hills. This does some riders' heads' in. For instance it took Paul a long time to be happy with his Cane Creek shock after being a big fan of the X Fusion, but also I think because he's still very much a hardtail rider. He would ride his Soul out of choice for most rides, so the firmer, more supportive ride of the X Fusion made more immediate sense to him. That said, you can get that kind of feel out of a Cane Creek by increasing the low speed damping to the far end of the range, but our experience in testing would suggest that you're doing yourself a disservice if you do. The Fox Float X2 seems to be very much the shock of the moment, but as with the Cane Creek, it's not for the faint hearted when it comes to knob twiddling. I have limited experience with this shock, but alongside us when we were testing earlier in the year, JPJ (from A Line Coaching, a brilliant rider coach and also a Cotic Ambassador) from was tuning in the Fox Float X2 for us on his Rocket. The thing with these big DH style air shocks (and I found this with the big DB Air) is that they're so supple and incredibly capable that they do definitely pull a bit of the life, pop and fun out of the bike. They're all about traction, bump absorption and speed. Which it has to be said, it's incredible at. The performance in high speed, rocky situations is fantastic. It's also about twice the weight of the inline shocks too, which is worth considering as well if you pedal to the top a lot. Low speed damping doesn't mean low bike speed, it means slow shaft speed. Damping is measure units of Force/Speed so the higher the speed of the shaft, the more force the damper exerts. In all dampers there are shims and ports which allow there to be different damping levels for different shaft speeds. Low speed damping is about managing your weight shifts, your support from the bike, and the pedaling as pedal induced movement of the suspension is definitely in the low shaft speed zone. It tends to manifest itself in how much movement you get under pedaling load, but also the small bump compliance, as small chatter might seem intuitively to be higher speed, but because the movements of the shock are relatively small too, it's still in the low speed domain. Hence low speed damping is not only linked to your preferences for the feel of the bike, it's also likely to change depending on your weight too. Because it helps the spring support you for things like bermed corners where the bike settles relatively slowly on it's suspension, but your weight is loading the bike, it stands to reason that a heavier rider will put more load in and need a little more 'slowing down' from the damper than a lighter rider. More low speed damping tends to feel more settled, more efficient, more 'conventional'. Less damping will see the bike moving more, but also feeling more lively. High speed damping is the opposite of the above. High shaft speeds, so when you're travelling quickly of rough ground the shock is moving very quickly, but also big single inputs like drop offs and bigger landing where the shock is moving from fully extended to a long way through it's stroke very quickly. The trade off here is that the less high speed compression damping you can run the faster the suspension gets out of the way of bigger, faster hits, but it also means it will 'blow through' it's travel more easily on bigger single hits too. Whilst I had a good appreciation of high speed damping, I did ask Joel from X Fusion about their high speed damping range on their Roughcut HLR forks at Eurobike and, as you might expect from a suspension expert, he schooled me! My point was I was querying the range of high speed damping offered on the forks as I - being reasonably quick and weighing 85kg - only used a couple of clicks in from the lightest setting. Joel made the point that Robin Wallner, the EWS racer they sponsor keeps asking them for more high speed damping! He said it's nothing to do with rider weight at this point, it's simply how hard and fast you're hitting big amplitude impacts. For me, because I'm not big on jumps and drops and my local terrain is fast and rough, I can get away with running light high speed damping to get the best possible bump absorption on rough ground because I'm not doing the bike hits and drops that would need me to ramp up the damping to stop it hitting the bumpstops. So it's not about weight, it's about the speed and style of the rider. Not only have we done plenty of general riding on the Cane Creek shock, we have also done some timed testing on a set piece of trail, with a bunch of us trying different things out and JPJ running the Float X2. The key thing was not only registering the subjective feedback; did it feel fast, loose, grippy, skippy? But we also used the timelaps watches and transponders to get timing data to see how these matched up. Here's where the interesting things came to light. We didn't change the high speed damping for this particular test. As mentioned above, it's very much rider and terrain dependent so we stuck with base settings of 1.0 turns of HSC and 3.0 of HSR. We did a couple of warm up runs on base settings to get our eye in, then started tweaking. The key thing here is that I wanted to test the extremes of setup to get a feel for which direction the setup needed to go. This is called bracketing. Work at the two extremes to 'bracket' the performance, then decide which of the extremes you want to work towards. Firstly we run full Low Speed Rebound. The bikes felt very stable, with lots of feedback of feeling like there was good pump and drive through rolling sections of trail. However the times showed that this setting was either the same or slower than the base settings. It felt secure, but it was slow. After that we ran Low Speed Rebound all the way to the minimum. This went two ways here. For me and JPJ (on the Fox) the bikes felt pretty wild, with no drive when pumping and we went quite a bit slower than full LSR. However, Will and Rich both reported the bikes feeling loose - Will's notes read bike felt 'odd, but better' - and both were faster than with full LSR. Interesting! We now put the LSR in a middle setting (12 clicks on the DB Inline) and Low Speed Compression all the off. Everyone got their fastest time on this setting! The feedback was that it felt like there was no pump, the bike just moved out of the way when you put your inputs in, but the flipside was that everyone reported incredible cornering grip, with the bike settling into the corner lowering the centre of gravity, but also firing you out as the shock rebounded. After this we ran full LSC. Although intuitively you'd expect the feedback to be better pump and more stable feel, it wasn't the whole story. JPJ reported the Fox felt like it had "more pump, but skipping over surface so lost confidence". So, more HSC feels more efficient, pedals better, the bike feels more 'solid', but they doesn't absorb the chatter on the surface so grip is lost as is confidence. The final run was done with LSC wound on, but less than half. On the DB Inline we ran 10 clicks of a possible 24, aiming for a sweet spot with a little more support but still keeping the grip. We all went slower and all the feedback was that it felt like a 'normal bike', but didn't seem to carry speed. Rich said it felt 'harsh'. The most obvious thing we also noticed was how much the bikes moved around with very little low speed damping when riding back to the top of the trail. And this is where I come back to the more adjustable shocks not feeling 'conventional'. Or rather, they seem to work best when they're not setup to feel conventional. With all the low speed damping somewhere towards the middle, they worked well, but weren't the quickest option. The Fox Float X2 seems to have a wider range of adjustment than the Cane Creek so JPJ hasn't ended up with running his compression all the way off, but after the experience with testing our base tune is now around 8-10 clicks of LSC and HSC to taste, but as light as you can get away with. Rebound damping set to rider preference, but definitely prefer the lighter end of the spectrum for LSR. We were running 2 volume spacers in the Float X2. Obviously there's much more you can fiddle around with, but I hope this gives you an insight into how you might set up your bike the best for you. Get some mates together and get some stopwatches out. It was an interesting morning on this particular test, but it was also a really good laugh being out on the trails with our mates, talking bikes. If you have any specific set up questions, do feel free to drop me a line anytime. If you'd like to hear more of this kind of thing from us, then sign up to the mailing list over on the Contact page.